Rufnit Kennels, LLC was established in 1978 and is licensed in the State of Nebraska. Don't let the term "Kennels" in our name fool you, our companions DO NOT reside outside in KENNELS or DOG RUNS...ALL of our companions are an extended part of our family and share our home. Originally we bred and trained Cocker Spaniels and Labrador Retrievers for AKC (American Kennel Club) obedience and field trials. During an upland hunt in 1993, Rufnit Kennels was introduced to the Braque du Bourbonnais. Maggie, was the first Braque du Bourbonnais to be registered and tested with NAVHDA (North American Versatile Hunting Dog Association) which is the foundation organization in North America for the breed. 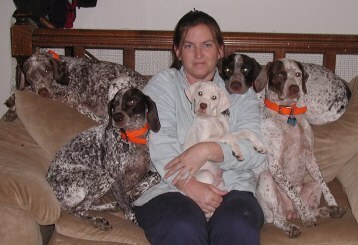 The Braque du Bourbonnais (Bourbonnais Pointer) proved to be the "Complete Companion" for the family and field. Not only was Rufnit Kennels introduced to a fantastic breed, but also to an outstanding organization, NAVHDA. Rufnit Kennels continues to make history by being the sole recipient of the prestigious "Natural Ability Breeder Awards" presented by NAVHDA for the Braque du Bourbonnais. These awards confirm that Rufnit Kennels is keeping on track with their breeding program. By NAVHDA using a "standard" for testing purposes, Rufnit Kennels can compare our Braque du Bourbonnais with other versatile breeds. We are producing Braque du Bourbonnais' with fantastic hunting instincts and abilities. Rufnit Kennels has produced the youngest Braque du Bourbonnais to receive "Prizes" in Natural Ability through NAVHDA at five months of age (proving true Natural Ability), the Utility Preparatory Test at eleven months of age and the Utility Test at nineteen months of age. Rufnit Kennels thrives on producing superior companions. To ensure the quality of our companions we take it a step higher than ever before, as the Braque du Bourbonnais breeder to DNA Certify our Sire's and Dam's. Rufnit Kennels is worthy of their place in the Braque du Bourbonnais' "history-in-the-making." Rufnit Kennels currently specializes in the Breeding and Training of Braque du Bourbonnais' and participates in NAVHDA, AKC/FSS and UKC sanction tests/events/shows. Dedicated to promoting quality in the breeding of purebred Braque du Bourbonnais and to do all possible to bring their natural qualities to perfection. who instilled in me the passionate affection for all living things. She will remain in my heart forever.